Our business process automation toolbox includes: tray.io, ifttt.com, parabola.io, automate.io, Integromat, piesync and, our personal favorite… Zapier! Automating tasks, and data management can save your company time, money, and mistakes. Think of using Zapier, or another workflow automation tool, as a cheaper way to write a custom program. Say you love the features of a CRM (like Salesforce, or Pipedrive) but they don’t integrate with your email marketing platform of choice (MailChimp, Drip, or ConvertKit etc); instead of tasking an assistant with data export and import on a regular basis our team will set up a system of zaps that connect the two apps, ensuring that data is accurately imported in an efficient and consistent manner. 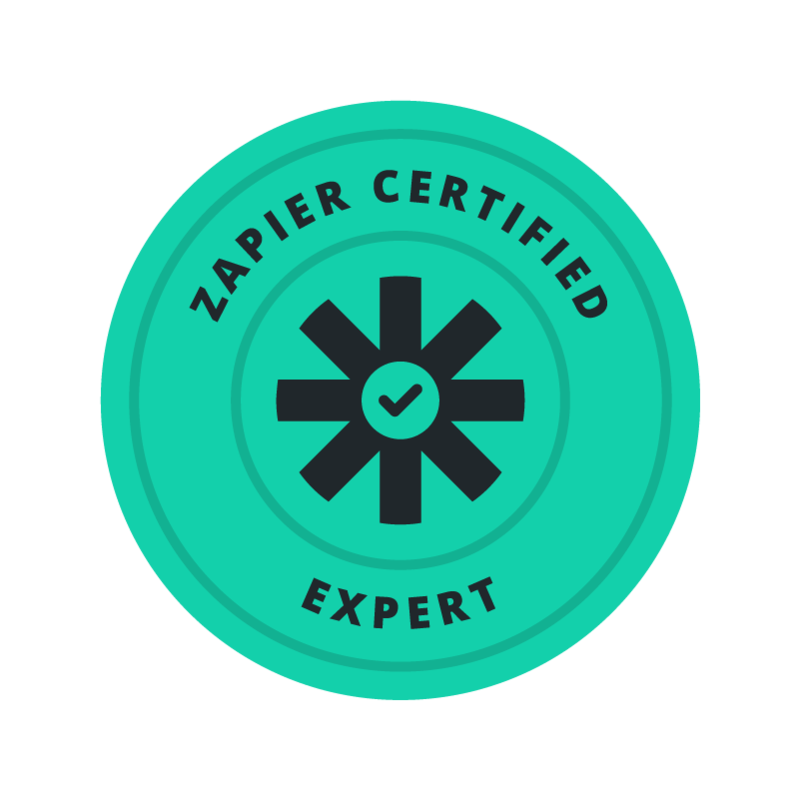 Connex Digital Marketing is proud to have two team members — Paul Kortman and Vera Nguyenova — who are Zapier Certified Experts! Zapier is an online automation tool that connects your favorite apps, such as Gmail, Slack, MailChimp, (and over 1,000 more) which then automates tasks without duplicating efforts. With this software, we can move information between your web apps automatically, which frees up precious time and allows you and your staff to focus on more crucial business matters. What is a Zapier Expert? Zapier Experts are consultants, and agencies, with advanced Zapier backgrounds, that are able to quickly locate process-inefficiencies, and creatively build and document automated solutions for their clients. As Zapier Certified Experts, we can create thousands of different workflows! In fact, we’ve even built highly complex (50 step) zaps, using webhook integrations and third party scripts to enable data to flow from non zapier-native apps. Don’t speak geek? Below are a few examples – written in layman’s terms – of ways Zapier can help you to be more efficient in the workplace. Check out this link for the top 100 apps on the Zapier platform! Trigger actions in other apps based on lead interactions with your website etc. Create dashboards in Google Sheets that are updated and kept current by importing data from various other third party CRMs or Business Data software. Enable follow up reminders via text messages for after new sales/lead meetings. As Zapier Certified Experts, Connex Digital Marketing is now part of the premier Zapier Experts Community, making us the ideal choice to improve processes, recommend new applications, and automate the workflows for you. With this new resource, we now have access to the industry’s latest developments to help move data between web applications in an automated manner. He’s a certified Nerd, having spent 12 years in the IT jungle. Vera is an average Vietnamese Czech girl with a black belt in karate. “Our team regularly uses Google Sheets to track our recruiters daily activity and performance. In order to maintain the form daily, we exported 9 files from our database and manually cut and pasted the data. This process required approximately 25 minutes daily to complete. Due to Connex Digital Marketing’s ability to automate this files directly into the sheet, our team has saved approximately 2 hours weekly. We respond within a business day! In order for us to help we have a few standard questions which will help us know how we can help you and what the process will look like, most often people want to know the cost and timeframe, if we have the answers to the following questions we should be able to deliver you an estimate on costs & timeframe. Any other comments/questions to help us? Trusted by companies large and small. Connex Social LLC DBA Connex Digital Marketing is a distributed team of digital marketing experts banded together since 2010 to serve clients in their digital marketing needs. We're a Digital Agency built for the future! More about Connex Digital Marketing. Join our growing service and get paid for referring customers through our affiliate program. We want to show you how you can dramatically increase your website traffic, for FREE! In order to acquire those customers you need more people (potential customers) to come to your website. This simple guide will show you the proven method of bringing dramatically more traffic to your website. Sign up below to get access to your FREE Guide!